The vast majority of migrants streaming onto the continent come from: Iraq, Afghanistan, Pakistan, Eritrea, Somalia, Nigeria and of course– Syria. The increase in the Muslim populations in European cities is so high it is having the collateral impact of driving Jews out of Europe—Jews are leaving Europe choosing to live in Israel, the USA or Canada. Many Jews believe they are no longer safe residing in European cities, mostly due to increasing Moslem activity against Jews. The Muslim immigration tide is creating deep fissures between European leaders. Western European political officials talk in terms of “solidarity,” “humanitarian duty,” and “compassion.” But the enthusiasm of Europe for embracing thousands of refugees has faded fast. The people of Central Europe were not enthusiastic about refugees crowding their train stations and highways from the beginning. Poland, Hungary and Austria are saying no to refugees settling in their towns and cities. In Southern Europe–Greece, Bulgaria, Italy and Serbia—are being overwhelmed with refugees—citizens are saying “no more”. Intellectual elites, which includes many of the leaders of Europe, believe multiculturalism could work—but it hasn’t worked. 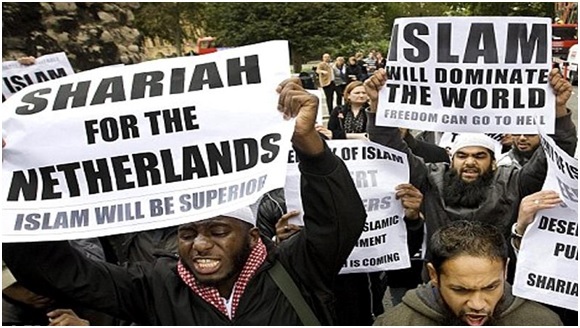 Islam has not melted into a smooth blended society of Europeans, Muslims and Jews. Many Muslims are not assimilated because they do not want to assimilate. Vast numbers of Muslims live in so-called no go zones—you see such zones in European cities such as Marseille, Paris, Brussels, London, Copenhagen, Malmö, Stockholm, Berlin and Athens. These zones are considered mini-countries within a country, where they have their own rules and codes of justice based upon Islamic law. No leader of Europe has been as outspoken as Victor Orban, Prime Minister of Hungary. He spoke of an “invasion” and asked if there were another word to describe the massive and often angry entry into a country of people who have not been invited to settle there. The leader of Hungary stressed that those who enter Europe are from a “different culture,” and asserted that Islam is not compatible with European Judeo-Christian values. Europeans elites thought and taught that poverty had led to the rise of Nazism, so they built welfare states that were suppose to eliminate poverty completely. But European social driven states have created a government-dependent class in Europe where many people live permanently on social handouts. These people are often Muslim. Muslim crime rates across Europe are high. In France, which has the largest Muslim population with the exception of Russia, the prison population is 70% Muslim. European prisons have become recruitment centers for future jihadis. Now lets take a look at the Muslim dilemma faced by the various countries of Europe. First…let’s take a look at Russia—Today, an estimated 20 million Muslims (including 6.5 million migrants from Azerbaijan and Central Asia) live in Russia. What you may not have known is that Russia hosts millions of guest workers, most of them from Muslim Central Asia. An estimated 3 to 5 million Uzbeks, 1 million Tajiks and 1 million Kyrgyz reside in Russia today—There are an estimated 2 million Muslims in Moscow alone, making Russia’s capital the largest Muslim city in Europe (total population of Moscow is 12 million). It is difficult to get an exact reading because Russia has so many guest workers that come and go—Most guest workers are Muslims. These Muslim guest workers live in the shadows, often without work permits. They are often subject to abuse, extortion and occasional violence. Germany now has 6 million Muslims—most of them are of Turkish descent. But concerning new arrivals to Germany–a large number (40%) are from countries in the Balkans, including Albania and Kosovo. This implies that nearly half of those arriving in Germany are economic migrants, not refugees fleeing war zones. — Thomas De Maizière, German Interior Minister. More than 750 German Muslims have joined the Islamic State and traveled to Syria and Iraq, and some of them have continued to receive welfare checks from the German state while on the battlefields of the Middle East. Many Germans are getting impatient with Angela Merkel soft stance toward allowing hundreds of thousands of refugees to come to Germany. The Chancellor is sliding in the polls. More to come in my next installment on this extremely serious crisis facing Europe. England’s Prime Minister Winston Churchill famously said, “Russia is a riddle wrapped in mystery inside an enigma.” Russia does not have a western European personality—the Russian people are different—they have strengths and they have their weak points. ●Russia is enormous; Russia is the largest country on earth in terms of surface area. To give you a sense of its size, Russia spans 11 time zones –its land mass stretching halfway around the world. ●Russia has about one hundred ethnic groups. ●The official language is Russian but there is 27 other languages co-official in various regions throughout the country. ●Russia has 21 million Muslims—the total population of Russia is 143 million. ●Moscow has the largest Muslim population of any European city, with estimates suggesting that between 1.5 and 2 million Muslims live in the Russian capital, (12 million citizens total in Moscow). ●America has the largest economy in the world, followed by China–Japan is the third-largest economy in the world. Germany is the fourth. Russian has the 9th largest economy in the world. ●Russia remains the world’s biggest natural gas shipper. 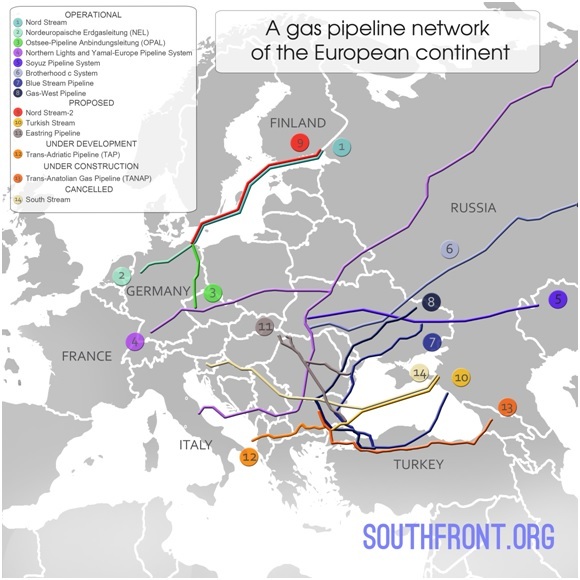 ●12 nations within the European Union rely on Russia for more than half their supply of natural gas. Millions of European homes are heated with natural gas coming from Russia. ●When it comes to oil, 35 percent of the European Union’s supplies are of Russian origin. ●Germany’s dependence on Moscow is even higher: the country sources 36 percent of its natural gas imports and 39 percent of its oil imports from Russian energy suppliers. ●Half of Russian natural gas exports reach Europe via Ukraine. This is why Ukraine is so important to Europe and to Russia. ●If Russia were to halt imports through the pipelines of Ukraine, the EU could survive for three months on reserves within its borders. ●Russia is Turkey’s biggest foreign source of natural gas, supplying over 50 percent (about 26 billion cubic meters) of Turkish natural gas consumption needs in 2015. ●Russia has the world’s second largest natural gas reserves. 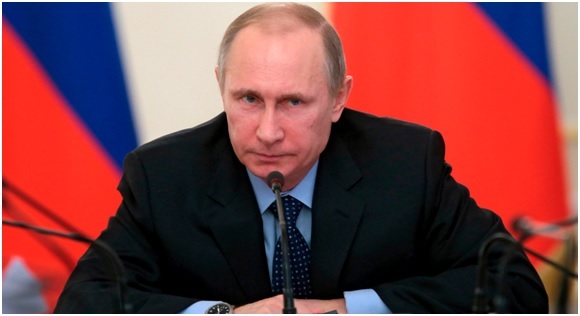 ●Russia has 87 billion barrels of proven oil reserves, enough to last it another 75 years. ●Russia rents a naval base from Syria in the port city of Tartus, Syria [this gives Russia a strategic foothold in the Mediterranean Sea]—this is very important to Russia. ●The recent deployment of S-400 anti-air missiles means Russia has effectively imposed a no-fly zone over Syria. ●Over 20 million Russians died in World War 2—14 percent of the population at that time. ●There are over 500,000 alcohol-related deaths in Russia each year. Russians have a reputation for being heavy drinkers. ●This is sad but true–25% Russians die before reaching the age of 55, compared to just 1% in the U.S., and Vodka is to blame. ●Japan and Russia still haven’t signed a peace treaty to end World War II due to the Kuril Islands dispute. ●The Swedes and Teutonic Knights jointly invaded Russia in [1240-1242] Russians led by Alexander Nevesky defeated both invaders. ●The Poles invaded Russia in [1605-1606] Polish occupation of Moscow until a Russian uprising in 1618 drove out the Poles. ●Swedes led by King Charles invaded Russia in [1708-1709] Russians led by Peter the Great defeated the Swedes. ●Napoleons French Grand Armee invaded Russia in  Napoleon forced to retreat because of winter. ●The Turks and Germans jointly invaded Russia during WW1 [1914-1918] Russia under Lenin signed peace treaty with Germans. Germans left Russia after WW1. ●Hitler’s Wehrmacht invaded the USSR in (1941-1945) and were driven out by the Red Army in 1944 led by Commanders Zhurkov, Konev and Chuikov. See Wikianswers.com—How many times Russia was invaded. In our next blog we will continue our discussion of Russia and its role in end-time events. Daniel 11:44 tells us that, “news from the east” will greatly trouble the king of the North (European dictator). Prophecy indicates that, Russia, China and other nations from the East will turn to confront Europe militarily, meeting at Armageddon (Revelation 16:12-16). These millions of troops will be united in their hatred of the returning Jesus Christ. They will surge against Him and be destroyed at Jerusalem (Zechariah 14:1-4; Revelation 19:17-21).